War Cabinet reshuffle, Churchill to chair committee directing general war policy. Soviets begin massacre of 20,000 Polish officers in Katyn Forest. 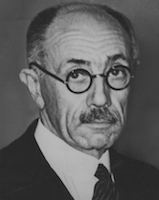 Hungarian Prime Minister Pál Teleki commits suicide rather than collaborate with Germany. In Iraq, military officer Rashid Ali overthrows Regent Abdul Illah and forms pro-Axis government. Japanese aircraft bomb Mandalay in central Burma, killing 2,000. They met no opposition from the RAF as all its aircraft had by now been withdrawn to India. The final Japanese offensive on Bataan begins with a five hour artillery and air bombardment, after which the Japanese launch infantry attacks supported byÂ some tanks, which allows them to make penetrations in to US-Filipino defensive positions. United States Navy Task Force 39 arrives at Scapa Flow to cover the Murmansk and Mediterranean runs, the first unit of the US Atlantic Fleet in British waters. Forty-two Royal Navy, fleet Air Arm Barracuda torpedo-bombers from the British aircraft carriers HMS Victorious and Furious hit the Battleship Tirpitz 14 times in a daring raid on the Alten Fjord, in Norway. The British Second Army reaches Munster; the U.S. Ninth Army captures Recklinghausen in the Ruhr, while the US First Army takes Fulda and Kassel. The Austrian resistance leader Major Szokoll and Russian military authorities confer about co-operation on the Russian offensive against Vienna. The 2nd Ukrainian front advances close to Vienna. The Russians breaches the German defensive lines between Wiener Neustadt and Neusiedler lake. Hard fighting continues as the Red Army advances towards Bratislava. British commandos secure islands in Lake Comacchio, Italy. MacArthur is appointed as C-in-C of land forces in the Pacific. Admiral Nimitz is appointed as C-in-C of all naval forces in the Pacific.